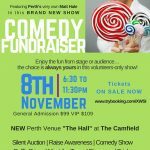 Its only 1 week until our Annual Fundraising event of 2018 where we are welcoming back Matt Hale Comedy Hypnotist to once again wow the crowd and leaving your cheeks hurting from the laughter. Once a year we come together with our friends and supporters to celebrate all we have achieved at Zonta House and the difference we have made in the WA community. It’s always the most amazing night packed with good vibes, great entertainment and even better food! This year we are at The Camfield Perth’s newest venue at Optus Stadium. We would love to invite you along to share in all that we have achieved over the past 12 months at Zonta House – because we couldn’t have done it without YOU! Tickets are just $99 for a three-course meal, drink on arrival and 75 minutes’ worth of incredible entertainment. We can’t wait to see you there. BUT HURRY! Seats are limited. Click HERE to grab your ticket.